In today’s global art market it is estimated that nearly 40% of the works sold every year are forgeries. Knowing the difference between a fake and an original requires the trained eye and knowledge of a qualified authority. Harry Halff Fine Art is one of few art galleries that offer this level of expertise when it comes to authenticating Julian Onderdonk works. Below, we answer the top four questions most people have about getting their paintings authenticated. 1. How does someone become a qualified authority? Qualified authorities are people who have extensively studied the artist in question and worked with artworks by the artist, published work about him or her, curated exhibitions at museums and galleries or have taught courses about the artist. 2. How do I find a qualified authority to authenticate the painting I own? There are a few ways to locate an authenticator. Reach out to art historians or curators at a specific museum who can direct you to a qualified authority. Get in touch with the author of the catalog raisonné on the artist (if there is one). Oftentimes, authors may be creating an addendum to the catalog raisonné with additional works found after publication. For instance, Harry Halff and Elizabeth Halff are the authors of Julian Onderdonk: A Catalogue Raisonné, and Harry is the expert on Julian Onderdonk works. 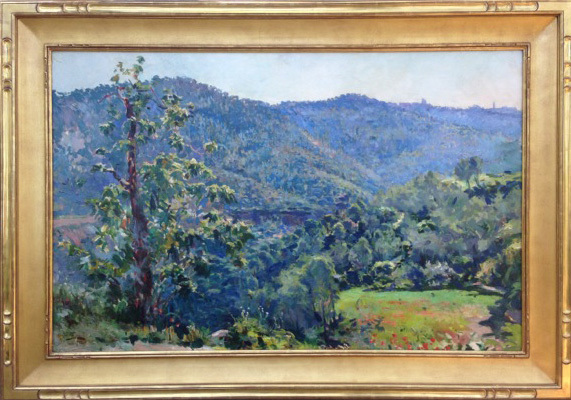 Harry Halff Fine Art is in the process of creating an addendum and does not charge to authenticate works by Julian Onderdonk. 3. What does the authenticator need from me? While it’s best for the authenticator to see the art in person, if you are not local often times you can send them a picture of the work. 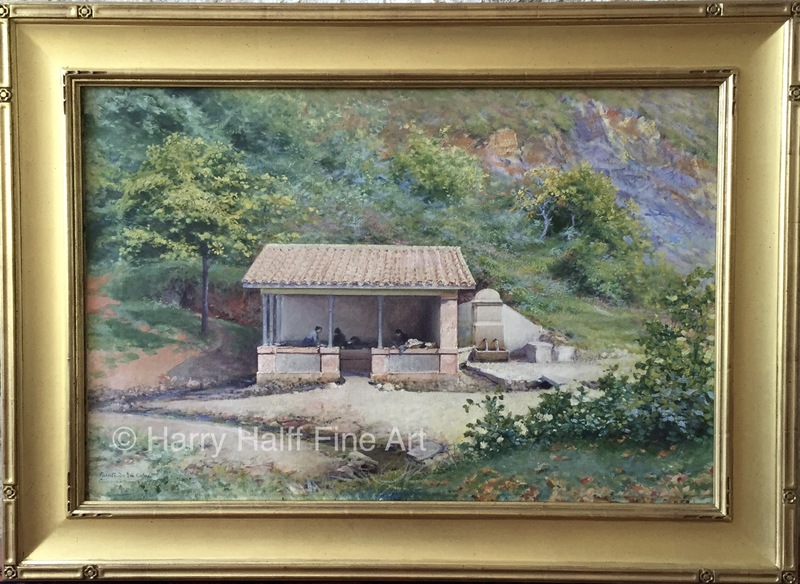 Send a few images of the entire painting and a few that are close up so the authenticator can see the brush strokes and any signatures on the actual painting. Include measurements of the painting and copies of any documentation that can contribute to the provenance (origin) of your piece. If you have bills of sale, newspaper/magazine articles mentioning the piece, names of previous owners or publication in the artists catalogue raisonné, include copies of those too. Look on the back of the painting. Is there anything written there? Many artists sign the back of their paintings with the title of the work and the location. The authenticator will need to see the signature to evaluate the handwriting. 4. Why is it important to get art authenticated? The first step in determining the value of a work of art is determining its authenticity. Authenticating gives the work of art validity and helps to begin establishing the value. We are interested in receiving any information concerning paintings and drawings as well as letters and documents concerning Julian Onderdonk or his works. There is no charge to authenticate works by Julian Onderdonk. One of the best ways to learn more about the art you love is to learn more about the artist who created it. So we put together a sample of some of the most informative and interesting books on early Texas art and artists. And while this is only a small sample of the work that is out there, these books will certainly be great resources and a start to building your own art library. Explore what inspired artists like Jose Arpa, Thomas Allen and Mary Bonner to create such magnificent works of art. Flip through catalog raisonnés that document the entire works of artists such as Julian Onderdonk and Herman Lungkwitz. Or simply learn more about that particular piece you just purchased (or are planning to purchase). 1. Harry A. Halff and Elizabeth Halff. Julian Onderdonk: A Catalogue Raisonne. Yale University Press. 2016. About this book: Elaborately illustrated, this catalogue is the definitive resource on Julian Onderdonk, an American Impressionist artist who lived and worked primarily in Texas. A native of San Antonio, who trained in New York with William Merritt Chase, Onderdonk (1882–1922) created vibrant paintings of the Texas landscape. This publication authoritatively demonstrates the breadth, quality, and brilliance of Onderdonk’s work, and illustrates his oeuvre—more than 1,200 pieces—in full. The book also includes an extensive chronology of the artist’s life and career, as well as an essay by Emily Ballew Neff, an expert on Western American art. The first publication to document the complete works of this talented artist, this catalogue raisonné brings Onderdonk’s extraordinary, lyrical paintings to a long-deserved national audience. 2. John Powers and Deborah Powers. Texas Painters, Sculptors and Graphic Artists: A Biographical Dictionary of Artists in Texas Before 1942. Woodmont Books: Austin. 2000. About this book: This is the most extensive and comprehensive reference book on artists who worked in Texas before the modern era that began with World War II. The 606-pages of the book cover some 3,800 artists, which distills a great mass of information obtained over fourteen years from archival collections, exhibition catalogs, reference works, monographs, periodicals, unpublished materials, and interviews and correspondence with living artists and relatives of deceased artists. 3. Steinfeldt, Cecilia. Art for History’s Sake: The Texas Collection of the Witte Museum. Texas State Historical Association. 1993. About this book: Divided by artists this is more of a definitive survey of Texas art and artists. Arranged in encyclopedia format, it covers more than a century of the most important Texas and Texas-related artists. Covering the period from 1845 to 1950, the collection is particularly rich in nineteenth-century Texas paintings. 4. Pinckney, Pauline A. Painting in Texas, The Nineteenth Century. University of Texas Press: Austin. 1967. About this book: From research in diaries, letters, newspapers, and other archival sources Pauline Pinckney compiled biographical sketches of more than fifty Texas artists. The book, one of the first of its type, emphasized the relationship of Texas artists to their culture. 5. Steinfeldt, Cecilia. The Onderdonks: A Family of Texas Painters. Trinity University Press: San Antonio. 1976. About this book: This book covers Yankee transplant Robert Jenkins Onderdonk to his San Antonio born children Julian Robert and Eleanor Rogers Onderdonk. Includes the work of Robert and his son Julian, whose last paintings, Dawn in the Hills and Autumn Tapestry, were shown in the 1922 exhibition of the National Academy of Design in N.Y. Rare and touches on how this creative family encouraged the arts in San Antonio from the 1880s until the Kennedy Administration. 6. Rudolph, William. Julian Onderdonk, American Impressionist. Yale University Press: New Haven. 2008. About this book: This lavishly illustrated exhibition catalogue offers a critical look at Impressionist Julian Onderdonk (1882–1922), one of Texas’s finest landscape painters and a pupil of William Merritt Chase. Onderdonk transformed the Texas landscape, creating indelible images of his native state. By his death at age 40, Onderdonk had been christened “The Bluebonnet Painter” in recognition of his lush signature landscapes featuring fields of the Texas state flower. 7. Graham, Baker. Julian Onderdonk in New York, The Lost Years––The Lost Paintings. Texas State Historical Association, 2014. About this book: Eventually turned into an exhibition, the book reveals that while Julian Onderdonk has heretofore been considered a Texas artist, he was also an American artist as more than one third of his body of work was created in New York City and depicts scenes from the surrounding area. Many of the New York works were signed with pseudonyms, each well researched and documented. This book brings Onderdonk’s years in New York City to light. 8. Paula L Grauer and Michael R. Grauer. Dictionary of Texas Artists, 1800-1945. Texas A&M University Press: College Station. 1999. About this book: The first comprehensive listing of Texas artists in more than sixty years, the Dictionary of Texas Artists, 1800–1945 highlights more than 2,500 artists who have lived, worked, and exhibited in Texas. About this book: This publication focuses on the life and times of Mary Bonner, one of the best-known Early Texas printmakers. Through the 127 pages you’ll find photos, illustrations as well as many color and black & white plates of the Bonner’s work. About this book: Theodore Gentilz (1820-1906), a middle-class Parisian trained in the disciplined draftsmanship of the French academic tradition, played a significant role in the French colonization of the wilderness beyond San Antonio. Gentilz produced a succession of remarkable paintings and drawings illuminating events, characters, customs, urban and rural landscapes, architectural and sculptural detail, flora and fauna-all within his chosen world. Supplemented by the descriptive memoirs of his close friend Auguste Fretelliere and fragments from his own early journals, these appealing genre works comprise Gentilz’s testimony to the richness of our multi-ethnic heritage. 11. McGuire, James Patrick. Iwonski in Texas: Painter and Citizen. San Antonio.1976. About this book: Born in Germany and eventually becoming a naturalized American citizen, Carl G. von Iwonski (1830–1912) was artistically active in San Antonio and New Braunfels, and best known for his portraits of Texas pioneers. This book was published in conjunction with an exhibition, Iwonski in Texas: painter and citizen, held at the Witte Memorial Museum in San Antonio, Texas, August 1, 1976, to September 30, 1976. 12. McGuire, James Patrick. Herman Lungkwitz, Romantic Landscapist on the Texas Frontier. University of Texas Press: Austin. 1983. About this book: This is the first comprehensive biography and catalogue raisonné of the remarkable painter who was Texas’ first important landscape painter. This book accompanies an exhibition held from 1983 -1984. Illustrated with 105 plates, 25 in color, and a color portrait of the artist as the frontispiece. The catalogue raisonné describes 341 works. 13. José Arpa Perea; Juan Fernández Lacomba; Javier Rodríguez Barberán; Jesús Saíz Luca de Tena; Fundación El Monte. José Arpa Perea. Fundacion El Monte: Seville. 1998. 14. McGuire, James Patrick. Julius Stockfleth, Gulf Coast Marine and Landscape Painter. San Antonio: Trinity University Press and Rosenberg Library, 1976. About this book: When a Texas oilman funded a national art competition for wildflowers in the late 1920s, the generous prize money swiftly attracted such artists as Jose Arpa, Dawson Dawson-Watson, and Oscar E. Berninghaus and Herbert Dunton (founding members of the Taos Society of Artists). In addition to a gallery of color plates representing the best of the winning entries, this book offers an intriguing portrait of art philanthropy and the development of artistic trends. 16. Stewart, Rick. Lone Star Regionalism, The Dallas Nine and Their Circle. Dallas Museum of Art and Texas Monthly Press. 1985. About this book: This book is filled photographs documenting the exhibition “Lone Star Regionalism: The Dallas Nine and Their Circle, 1928-1945,” February 3-March 17, 1985, held at the Dallas Museum of Art including forty gallery installation views of the exhibition. About this book: In this unusual blend of biography, art, history, conventional history, and cultural anthropology, William Newcomb assembles most of the available biographical data and weaves in a rich body of interpretive background material pertaining to both Germany and Texas. 18. DeShong Ratcliffe, Sam. Painting Texas History to 1900 (American Studies Series). University of Texas Press: Austin. 1992. About this book: The author examines the works of more than forty artists, including Henry McArdle, Theodore Gentilz, Robert Onderdonk, Friedrich Richard Petri, Carl G. von Iwonski, and Julius Stockfleth. He places each work within its historical and cultural context to show why such subject matter was chosen, why it was depicted in a particular way, and why such a depiction gained popular acceptance. With their visual narratives of events that characterized all of America’s westward expansion these works add an important chapter to the story of the American West. For our second blog we have decided to focus on our “Jose Arpa: Painting in the Americas” exhibition, which was held March 25th through April 9th, 2010. Paintings in the exhibit were drawn from Jose Arpa’s body of works from Mexico, Texas, and Arizona; their unifying feature is the strong southern light. His canvases are painted with whites, beiges, and reds in the Earth and buildings , cool greens in the heavy vegetation, and dark blues and purples setting the shadows. Arpa often chose what seem to be the most difficult compositions and handled them effortlessly. One of the pleasures of viewing his canvases is seeing delicate colors juxtaposed together and intimate spaces created with only a few quick brushstrokes. The subjects that interested Arpa range from landscapes to genre scenes to psychological portraits. In his youth in Sevilla, he developed his love for Moorish architecture and the shadows created by its arches and recesses. When he arrived in Mexico and later in Texas, he enjoyed the same strong sunlight found in southern Spain. Light upon the water, which he first painted on the Guadalquivir River in Sevilla, was a lifelong source of fascination as were people going about their daily tasks. Arpa was trained in the academic tradition in Spain and Italy, and later painted in the Plein-Air Realism style typical of Garcia Rodriguez and Sanchez Perrier in Sevilla. He was also very familiar with the Spanish painter Sorolla, and Arpa’s bravura brushwork was certainly influenced by him. As his individual style developed, he painted with rapid brushwork, low impastos in the foreground and a natural eye for complementary colors. Stylistically, Arpa is an intuitive painter blending Plein-Air Realism and Impressionism depending on his subject matter and the location.